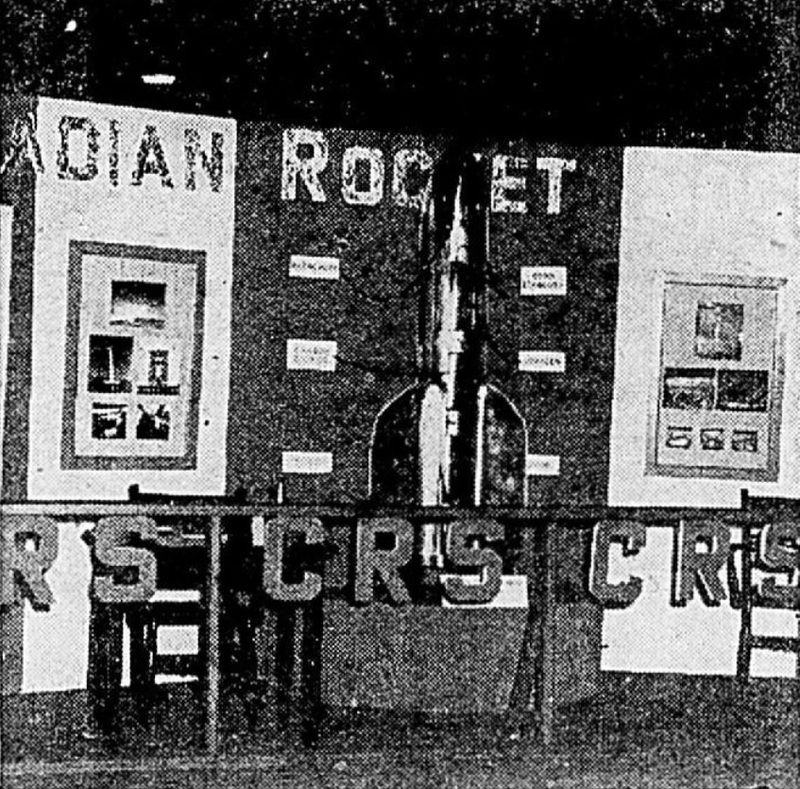 The Moon rocket model of the Canadian Rocket Society, Canadian National Exhibition, Toronto, Ontario, 1948. Anon., “Un groupe de Canadiens n’attend que des capitaux pour construire une fusée qui les mènera à la lune.” Photo-Journal, 3 February 1949, 44. Bienvenue and welcome, my faithful if slightly masochistic reading friend, for another conversation on the wonders of aviation and space as seen through illustrations found all over the place. For this week’s issue of our blog / bulletin / thingee, for example, yours truly went back to a frequent source of mine, a long defunct weekly newspaper from Montréal, Québec, Photo-Journal, more specifically the 3 February 1949 issue. Even though I am far more familiar / comfortable with the aviation element of the mandate of the Canada Aviation and Space Museum of Ottawa, Ontario, my employer since 1987, I do like to stretch my mind by entering the cold, dark and hostile realm of space. Actually, we won’t quite get to space this week, even though our main topic will be rockets and rocketry. You see, my reading friend, various groups of rocket enthusiasts popped into existence during the 1920s and 1930s and formed societies / associations. The first such group known to have built something was / is the Verein für Raumschiffahrt (VfR). Founded in July 1927, in a city now located in Poland, this very important German society included individuals who were / became quite famous. One only needs to mention Wernher Magnus Maximilian von Braun. This young member of the VfR mentioned in a January 2019 issue of our blog / bulletin / thingee truly came into his own after the Nationalsozialistische Deutsche Arbeitpartei (NSDAP) came to power in 1933 and after the disappearance of the VfR, in 1934, as a result of lack of funding, internal conflicts and the departure of certain members, including von Braun. From then on, the design of German rockets took place under the control of the military. Indeed, von Braun supervised the design of the A-4, the (in)famous V-2, the world’s first ballistic missile. After surrendering to the Americans, in 1945, the somewhat opportunistic and arrogant von Braun worked for the Army Ballistic Missile Agency (ABMA), then for the National Aeronautics and Space Administration (NASA). His team developed the Saturn V rocket that helped land humans on the Moon. Hushed up for many years, von Braun’s involvement with the NSDAP was / is / will be a matter of controversy. The Union of Soviet Socialist Republics (USSR) was arguably the country where one could find the greatest number of rocket enthusiasts. These young men found their inspiration in the pioneering work of Konstantin Eduardovich Tsiolkovsky, the father of cosmonautics, at least according to the Soviets / Russians. Two groups were officially founded in November 1931: the Leningrad-based Leningradskaya Gruppa po Izucheniyu Reaktivnogo Dvizhenia and the Moscow-based Gruppa po Izucheniyu Reaktivnogo Dvizhenia. One of the young members of the latter was Sergei Pavlovich Korolev, the anonymous chief designer of the USSR’s first intercontinental ballistic missile, the R-7 Semyorka, in the 1950s. From the early 1930s onward, at least 9 other rocket societies were founded throughout the USSR. And yes my astute reading friend, the R-7 was the rocket used to launch Sputnik I, the first artificial satellite, mentioned in several issues of our blog / bulletin / thingee since July 2018. British rocket enthusiasts were an unlucky lot during the 1920s and 1930s. They could not turn to pioneers like Tsiolkovsky for inspiration. Worse still, the Explosives Act of 1875, a piece of legislation sometimes known as the Guy Fawkes law, expressly prevented private individuals from manufacturing or experimenting with materials and chemicals that that could be used as rocket fuel. This being said (typed? ), the Manchester Interplanetary Society (MIS), an association founded in June 1936, illegally fired a number of small black powder rockets. In March 1937, during a demonstration, one of these exploded upon ignition, injuring some of the spectators. Four MIS members were charged. The young president of the society, Eric Burgess, so dazzled, dare I say blinded, the court with science that the magistrate let the accused go after obtaining a promise that they would never use certain chemicals again. Testing apparently continued nonetheless, in a remote moorland. Would you believe that Burgess was the individual who proposed the idea of attaching a gold-plated aluminum plaque carrying a message from mankind aboard the first human spacecraft designed to leave the solar system, namely Pioneer 10 and 11. He did so in late 1971 during a visit to NASA’s Jet Propulsion Laboratory. The soon to be famous astronomer and science populariser Carl Edward Sagan loved the idea and convinced the higher ups to go for it. Pioneer 10 and 11 were launched in March 1972 and April 1973. A plaque was attached to each spacecraft. The aforementioned court appearance and the relative importance of rocket tests led to conflicts within the MIS. In December 1937, the small group interested in rocketry founded the Manchester Astronautical Association. In 1944, this association merged with the Astronautical Development Society, a group founded in 1938 by 2 young draughtsmen at a famous airplane manufacturing company, Hawker Aircraft Limited, a member of aeronautical giant Hawker Siddeley Aircraft Company Limited / Hawker Siddeley Group Limited. The resulting association, the Combined British Astronautical Society, merged with the British Interplanetary Society (BIS) in September 1945 to form British Interplanetary Society Limited. Did you know that the BIS included among its members one of the most influential science fiction writers of the 20th century, Arthur Charles Clarke, a gentleman mentioned in November 2018 and January 2019 issues of our blog / bulletin / thingee. Even though there were precious few rocket researchers in the United States in the late 1920s and early 1930, the idea of space travel was very popular among a vocal community of enthusiasts. These people revered the American engineer who, in March 1926, had launched the world’s first liquid fuelled rocket. A secretive loner often referred to as the father of modern rocketry, at least by Americans, Robert Hutchings Goddard wanted nothing to do with the enthusiasts. The American counterpart of the VfR was the American Rocket Society (ARS). Originally known as the American Interplanetary Society (AIS), this forerunner of today’s American Institute of Aeronautics and Astronautics (AIAA) came into existence in April 1930. It acquired its new name in the spring of 1934. Ironically, Goddard’s base of operation from the early 1930s onward was Roswell, New Mexico, a location well known to ufologists and science fiction writers. Eager to find out if the USSR was testing nuclear weapons, the United States Army Air Forces began Project Mogul in 1946. This top secret endeavour saw the launch of numerous balloons fitted with sensitive microphones. One of these balloons crashed near Roswell in July 1947. To use a worn out cliché, the rest was / is / will be history. And you are right, my reading friend, Goddard was mentioned in a previous issue of our blog / bulletin / thingee. An August one, you say? A July one, say I. You can check if you don’t believe me. Many if not most of the founding members of the AIS / ARS were science fiction writers, a situation found in no other rocket society of the period. One of these individuals was Laurence Edward “Laurie” Manning, a Canadian who was training in the Royal Air Force, in Canada, when the First World War ended. This part time science fiction writer served as society president and editor of its newsletter. Manning also worked on the engines developed by the society. He even built its launch stand, at his house, in 1933 and bought a piece of land where the early rockets of the AIS / ARS could be launched. Manning’s many contributions were recognised on several occasions: a medal given by vice president Lyndon Baines Johnson, an honorary life membership of the AIAA, and a mention of his name in a list of rocketry pioneers in the National Air and Space Museum of Washington, District of Columbia. It is worth noting that an early member of the AIS / ARS was Robert Anson Heinlein, one of the most influential if somewhat controversial science fiction writers of the 20th century. Before I forget, you may wish to note that some of Manning’s stories were published in magazines created by Hugo Gernsback, born Hugo Gernsbacher. This inventive and versatile Luxemburger American was fascinated by science and inventions. In 1908, Gernsback launched Modern Electrics, one of the first if not the first magazine dedicated to wireless telegraphy / radio. By 1920, the amount of “scientifiction,” a word he conjured out of thin air, contained within Electrical Experimenter, a moniker adopted in 1913, had increased to such an extent that Gernsback renamed his monthly magazine Science and Invention. In 1926, he started Amazing Stories, the first English-language science fiction periodical. Indeed, one could argue Gernsback was / is the father of American science fiction, or SF. To this day, the annual Science Fiction Achievement Awards, given for the first time in 1953, are almost universally known as Hugos. Sadly, Gernsback may well have been a greedy individual, dare one say a borderline crook, who often did not give a rodent’s posterior about the rights of the people who wrote the stories he published, but back to our story. Lets us conclude this brief survey of the interwar phase of the history of rocketry with a few words on the main topic of this article, namely the origins of rocketry in Canada. The one group / club known to yours truly was formed around 1936 at the Central Technical School in Toronto, Ontario. It was seemingly known as the Rocket and Space Study Club. Its founder was a teenage German immigrant named Kurt Richard Stehling, possibly born Kurtiz Stehling. The club was in regular contact with individuals and groups. One only needs to mention the ARS and the BIS. You may be pleased to hear (read?) that Stehling was mentioned in the aforementioned July 2018 issue of our blog / bulletin / thingee. Would you believe that Stehling shared his birthplace with Major General Walter Robert Dornberger, the somewhat arrogant and unpleasant officer who headed the aforementioned A-4 / V-2 program? As well, did you know that Justus von Liebig, a world famous 19th chemist, taught at Ludwigs-Universität, an institution of higher learning located in Stehling’s birthplace? Small world, isn’t it? It may be smaller than you think, actually. As a child growing up in Germany during the 1920s, Stehling witnessed some of the rocket trials conducted by the son of a well off industrialist established in that same birthplace. While in Canada, he spent a lot of his spare time and money to buy science fiction magazines published by the aforementioned Gernsback. Am I correct in assuming that your typing fingers are itching to ask a question, my reading friend? The name of Stehling’s birthplace was / is Gießen, a small German city. Back in 1934, Stehling and a few other Central Technical School students, presumably members of the Rocket and Space Study Club, built a tiny rocket fuelled with methane and oxygen. They set out to launch it from a window of a school laboratory. As someone pushed the ignition button, a panel of the window closed. The rocket shattered it as it flew off. As leader of the team, Stehling had to pay for repairs to the window. Not one team member offered to help. Stehling was also punished for his unauthorised and potentially quite dangerous experiment. Many people at the Central Technical School openly called him the Mad Professor. As a German Canadian, Stehling may not have been very popular with some teachers. Apparently oblivious to the Canadian version of the Explosives Act, the 20 or so members of the Rocket and Space Study Club built and tested a number of small gunpowder rockets. These activities proved intriguing enough to get Stehling on the radio for an interview, in 1939, at a local station. The onset of the Second World War brought the activities of the club to a close. As a German immigrant, Stehling seemingly had to push hard to enlist. He served overseas, in the Royal Canadian Armoured Corps. When the Second World War ended, Stehling returned to Toronto. He completed a bachelor’s degree in physics and astronomy at the University of Toronto. Stehling had not given up his interest in space, however. He founded and headed a rocket society at the university (Atomic and Rocket Society? Atomic Rocket Society? Rocket Society?) at some point. Stehling seemingly met members of another Toronto-based organisation, the Canadian Rocket Society (CRS), on a number of occasions. The CRS absorbed its smaller competitor around 1948. Stehling became its president at some point. The CRS was founded in 1942 by a small number of rocket enthusiasts, more or less as a Canadian equivalent of the VfR. Its varied membership included more than 100 individuals as of 1951, including several physicists, engineers and astronomers. The CRS made the news in 1949, in Canada, the United States and beyond, as a result of one or more interviews that discussed the possibility of a trip to the moon around 1960, aboard a 60-metre (200 feet) tall nuclear-powered rocket, the C-1, that seemingly tipped the scale at 1 000 or so tonnes (1 000 Imperial tons / about 1 125 American tons). The president or chairman of the CRS, a civil engineer from Toronto and reserve captain in the Royal Canadian Engineers of the Canadian Army by the name of Edward Cecil Evans Fox, indicated that a trip to the Moon would cost approximately $ 6.5 million – that’s million with an M, which seemed a tad low. The rocket was to be launched from a facility located on top of a mountain, seemingly in British Columbia. It looks as if there would be no attempt to land on the Moon, at least not on the first flight there. Fox and other members of the CRS were hopeful that a sponsor would be sufficiently impressed by their project to agree to fund it. They seemingly contacted Canadian manufacturing companies to see if intricate parts for their rocket could be produced. The companies’ answers have not been recorded but one can presume that not one part was made. Interestingly, Fox believed that, if the scientists, industries and governments of the world acted in concert, they would be able to launch, no later than 1950, a spaceship that would not only be able to reach the Moon and see its hidden side but also reach Mars, in less than 3 months. He readily admitted that many obstacles would have to be surmounted before any flight to Mars or even the Moon could be attempted. Oddly enough, Fox seemed to believe that a refrigeration system would be required to protect the spaceship from the intense heat of space during its long trip to Mars. He pointed out, quite matter of factly, that the space explorers’ wives would come along for the trip. A 1.8-metre (6 feet) model of the giant rocket was displayed at the Canadian National Exhibition, in Toronto, in 1948 and, perhaps, 1949. It was put together at least in part by a dedicated member of the society, a British-born electrician and First World War veteran by the name of Samuel “Sam” Kernerman. Fox showed the plans of the rocket to one or more groups of people during a summer of 1949 visit to New York City that caught the eye of The New York Times newspaper. Kernerman was quite the character. While serving in Palestine and Egypt, during and after the First World War, he met David Ben-Gurion, born David Grün, one of the fathers of Israel, and Thomas Edward Lawrence, in other words Lawrence of Arabia. Although not an especially good businessman, Kernerman was a creative soul who invented an automatic dishwater and a washerless faucet, among other things. He was president of the CRS at some point. Hillel Diamond was another president of the CRS. Born in Montréal, Québec, this musician and founding member of the society spent most of his life in Toronto. Fascinated by science throughout his life, Diamond mentored countless young Torontonians who visited his very popular and well known Science Shop, which served as a weekly meeting place for CRS members. If truth be told, he played crucial role in legalising and popularising rocketry as a hobby in Ontario, if not Canada as a whole. One of the members of the CRS was none other than Gordon Neil Patterson, the first director of the department of aeronautical engineering at the University of Toronto. Creator, in July 1939, and head, until June 1945, of the aerodynamics division of the Aeronautical Research Laboratory of Australia’s Council for Scientific and Industrial Research, Paterson was recognized worldwide for his research on supersonic flight. He became the founding director of the Institute for Aerophysics, today’s University of Toronto Institute for Aerospace Studies, in April 1949. This organisation, based in Downsview, a suburb of Toronto, absorbed the aeronautical engineering department at that time, but back to our story, and Fox. Fox’s talks on rocket flight, after the end of the Second World War, proved so popular that they led to an interview on Canadian Cavalcade, a very popular musical radio show broadcasted by the Canadian Broadcasting Corporation which counted among its interviewers none other than Lorne Greene, born Lorne Himan Green, a gentleman mentioned in a September 2018 issue of our blog / bulletin / thingee. Canadian Cavalcade, if you must know, was sponsored by Borden Company Limited, a company well known for its milk products. For a time during the Second World War, Fox was associate editor of Air Force Review, and chairman of its board, and here lies a tale. Sorry. The first issue of this monthly, the official organ of the Canadian section of Comrades of the Royal Air Forces, was dated July 1940. The link with this British organization known today as the Royal Air Forces Association was broken, however, with the December issue. Delivery problems led Air Force Review’s management to abandon its publishing house, Copp Clark Company Limited of Toronto. This transfer became visible in the April 1941 issue, shortly after the founding of its new publisher, Anglo-American Publishing Company Limited of Toronto, a firm created to publish comic books on Canadian soil. Indeed, while it is true that aviation was a serious business, it nevertheless had a more recreational side. It was during the Second World War, for example, that comic books took off in Canada. The War Exchange Conservation Act and the imposition of a 10% tax on comic books from the United States caused the reorientation, or even the creation of local publishing houses that joined this adventure. Anglo-American Publishing was one of them. This publishing house produced Canada’s first comic book, in 1941. Robin Hood and Company was a subtle blend of Canadian content and redrawn American stories. None of the characters created by its artists survived for long after the end of the Second World War, and the reintroduction of American comic books on the Canadian market, but I digress. A brand new organization, the Aeronautical Institute of Canada, of Toronto, took over from Anglo-American Publishing in the late summer of 1942 and continued the publication of Air Force Review. Created to promote aviation during and after the war, this institute absorbed an almost unknown organization, the Aviation Association of Canada, just after its formation. The Aeronautical Institute of Canada may not have survived long after the end of the Second World War. In fact, Air Force Review, which became Aviation Review in March 1944, seemingly disappeared soon after the return of peace. The first editor-in-chief of Air Force Review was an important character forgotten today. In the late 1930s, Clifford Gordon Bannington Stuart launched Aeroplane Photo Supply (Incorporated? ), a small Toronto-based company that sold photographs of aircraft. These proved very popular among aviation enthusiasts on both sides of the Canada-United States border. Over the years, his collection grew in importance and ended up with more than 6 000 different photographs and about 20 000 books on aviation, an inventory unmatched elsewhere in the world it was said. Customers who used Stuart’s catalogues to purchase photographs and / or books were found on both sides of the Atlantic. In 1946, Stuart founded Aircraft and Jets. He was its managing editor. It seems that only 2 issues of this monthly magazine appeared, in June and December. Aircraft and Jets contained a large number of photographs, most likely from the collection of Airplane Photo Supply. In fact, the magazine contained advertisements for this company and Stuart’s bookstore, also located in Toronto. In 1958, this great collector before God left Canada to settle in a British castle. He moved in with his photographs and books. In 1959, Stuart sold his photographic collection to the National Air Museum, today’s National Air and Space Museum. Yours truly does not know what happened to the books of this heavenly enthusiast, but let us go back to our story once again. Incidentally, both Air Force Review / Aviation Review and Aircraft and Jets can be consulted at the amazing library of the Canada Aviation and Space Museum. The CRS experienced a prolonged decline from the early 1950s onward. By the mid 1960s, it was pretty much moribund. The aforementioned Diamond resurrected it, as an amateur rocket club, during that same decade. The CRS may have disappeared in later years. Its links with the Toronto Rocket Club, a group active in later years, were / are unclear. As of 2019, there seemed to be no active rocket club in Toronto. Believing there was no future in Canada for a German Canadian like him, Stehling moved to the United States in 1948, with his American wife. He worked for Bell Aircraft Corporation until the mid 1950s or so. This being said (typed? ), Stehling also spent some time with the head of the State University of Iowa’s space research program, the astrophysicist James Alfred “Jim” Van Allen, in the early 1950s. The 2 men tested the use of balloons to allow relatively small rockets to reach high altitudes, a concept known as the rockoon (ROCKet + balloon). And yes, Bell Aircraft was mentioned in July and August 2017 issues of our blog / bulletin / thingee. By the way, Stehling became a member of the aforementioned ARS in the late 1940s. You may be pleased to hear (read?) that several rockoons were launched from United States Coast Guard ice breakers sailing in Canada’s Arctic during the first half of the 1950s. And yes, my reading friend, there was a raccoon named Rocket in a movie we all know and love. Focus. Please. In 1955, while working at the Naval Research Laboratory, Stehling became the head of the propulsion group for a newly created United States Navy program that resulted in the design, by Martin Company, of a relatively small satellite launching rocket, the Vanguard. This program was known as, you guessed it, Project Vanguard. The work was done under the auspices of the International Geophysical Year, a period of about 16 months devoted to research on the Earth accomplished on a global level that was mentioned in a July 2018 issue of our blog / bulletin / thingee. Incidentally, the Vanguard rocket was mentioned in that same July 2018 issue of our blog / bulletin / thingee. The first American attempt to launch an artificial satellite, in December 1957, soon after the launch of the world’s first artificial satellite, the USSR’s Sputnik I, in October, was a massive failure: the Vanguard rocket blew up on the launch pad. This televised national embarrassment was amusingly / insultingly mocked (stayputnik, stallnik, sputternik, splatnik, puffnik, pfftnik, oopsnik, kaputnik, goofnik, flopnik, failnik, dudnik, etc.) by a great many of American and foreign newspapers. Von Braun’s team at the aforementioned ABMA more or less saved the day by launching the first American artificial satellite, Explorer 1, in January 1958. You may ask yourself how the boys from ABMA were able to perform this feat so quickly. The truth is that some members of that team did not think that the December 1957 launch of the Vanguard rocket would be successful. One or more high ranking United States Army officers allowed them to discreetly / secretly prepare a rocket, just in case. And yes, my reading friend, Explorer 1 was mentioned in a July 2018 issue of our blog / bulletin / thingee. Incidentally, in March 1958, a Vanguard rocket launched TV-4 (Test Vehicle-4) / Vanguard I, the second American artificial satellite. The Vanguard was apparently selected to launch the first American satellite because it was developed by American engineers to carry scientific instruments, an origin story that corresponded to the desire of the administration headed by president Dwight David “Ike” Eisenhower that space exploration be a peaceful endeavour. ABMA’s rocket, on the other hand, was an intermediate range ballistic missile, the ABMA / Chrysler SM-78 Jupiter, developed at least in part by German American engineers, former V-2 project engineers to be more precise, to carry a thermonuclear warhead. The rocket of the United States Air Force (USAF) was also a missile, developed by American engineers to carry a thermonuclear warhead, and it was not quite ready yet. You will remember, or not, that Eisenhower was mentioned in a March 2018 issue of our blog / bulletin / thingee. And yes, my reading friend, the rocket of the USAF was the Convair SM-65 Atlas intercontinental ballistic missile, a weapon mentioned in July and September 2018 issues of our blog / bulletin / thingee. And yes again, the name Chrysler typed a few lines above referred to Chrysler Corporation, a major American automobile manufacturer mentioned in a January 2019 issue of our blog / bulletin / thingee. I bet you did not know it also made weapons of mass destruction at one point – a case of turning ploughshares into swords, if I may say so. And yes, my slightly annoyed reading friend, there are a lot of thingees in the present article. Would you believe that ABMA’s team might, I repeat might, have been able to put something in orbit as early as September 1956? The Jupiter rocket launched at that time was seemingly modified to ensure that it did not “accidentally” place its fourth and final stage in orbit. The order to make these modifications may have come from Eisenhower himself. Von Braun was not amused. Although inactive since 1964, the grapefruit-sized Vanguard I was still up there as of early 2019 – the oldest human-made object in space. This pioneer in the use of solar power in the hostile environment of space should remain in orbit until the year 2200, but back to our story. Stehling was a member of the Rocket and Satellite Research Panel, set up by Eisenhower, which strongly recommended, in 1957, the creation of an American space agency. As we both know, NASA came into existence in July 1958, as the National Aeronautics and Space Agency. Stehling himself joined this world famous organisation in late 1958, when responsibility for Project Vanguard was transferred to it. You may be pleased to hear (read?) that he may have been one of the first people at NASA, or anywhere, to suggest that, given equal training, women astronauts could be as good, if not better than male ones. Stehling was a senior scientist at NASA for a few years. By the mid 1960s, he was the vice-president of a company known as Electro-Optical Systems Incorporated. By 1971, Stehling was senior aerospace and technical advisor on undersea technology at the National Oceanic and Atmospheric Administration. One of the projects he worked on after retiring was the use of giant airships as a fuel efficient way to carry freight around the globe. Stehling died in March 1997, at age 77. I don’t know about you, my reading friend, but I think I’ve caused enough mischief for today. I therefore bid you farewell and adieu, until next week.